Paul Racine (Lambert) is a New York businessman on a business trip to Tokyo. After getting involved with the beautiful Kirina (Chen), he finds himself inadvertently drawn into the shadowy world of Ninjas. When he tries to stop her murder, it’s “Businessman to the rescue!” but he doesn’t realize what he’s up against. None of the Tokyo authorities believe Ninjas still exist in modern-day Japan. Obviously they’re not aware of the highly-trained, yet evil Kinjo (Lone) who now takes Paul as his main enemy because he knows too much. So Paul trains in the ways of the Ninja to face off in the eventual final confrontation with Kinjo. Who will win? 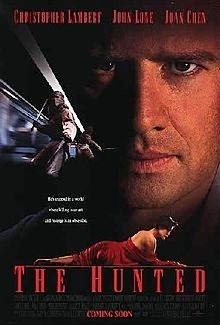 The Hunted comes from a not-so-distant past when Christopher Lambert movies came to the movie theater. And ones about Ninjas no less. Ah yes, it was a different time in our nation’s history indeed. Part of the interest of a Christopher Lambert movie is attempting to decipher and determine if it’s a Christopher Lambert movie or a Christopher Lambair film. The jury may still be out on The Hunted, because it is a fairly glossy, professionally made product with an almost two-hour running time and a pretty slow pace by today’s standards. But because it’s a movie about Ninjas with a lot of “Sword Violence”, it’s probably an “Ert” title, not an “Air” film. We give the movie credit for the fact that when the Japanese locals talk, it’s in Japanese with subtitles. So many movies have locals in foreign countries speaking English to each other. Speaking of voices, Lambert’s is kind of odd. It’s accented, of course, but the real problem is that it’s a bit thin and quiet to boot. With a more powerful voice, his screen presence could have been improved. The Hunted is at its best when it’s executing its action setpieces, and the scene on the train is a movie highlight. But on the whole the movie seems bloated, and some trimming could have helped. Plus the movie takes itself so seriously. 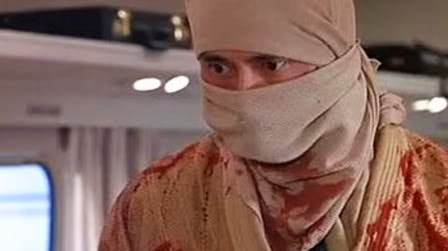 During the Ninja scenes in the woods, it made us miss Godfrey Ho and the fact that Ho’s Ninjas have headbands that say “Ninja” on them. Well, maybe they don’t have to be that silly, but a happy medium would be nice. We appreciate the professionalism and the obvious care that was put into the action/stunt sequences of The Hunted, but the hard fact is that this is not an essential movie. You could probably miss this one and not feel too bad about it. But if you do see it, you’ll see a competently-made and pretty slick time-filler. This is a pretty solid film, though is far as theatrical Ninja films go, Ninja Assassin was better. Ninja Assassin had some good moments, but too much CGI. I kind of feel that Lambert got cast in this film purely by the fact he already knew loads of sword fighting from the Highlander movies (see also: Beowulf 1999). It's a pretty good flick but a little silly towards the end (Lambert just picks up sword fighting and takes down John Lone with no prior experience??). I watched it years ago and rewatched it again recently on DVD. Stupid UK DVD didn't have subtitles for any of the Japanese bits though (took me a while to realise) which meant my wife and I just dubbed our own lines "live". Definitely a decent movie. Would love to have heard the lines you made up with your wife. Haha. I remember really liking this movie as a kid, and recalling a pretty badass fight scene on a subway or something? Anyway, great review as always, gents. Ah, the days when Lambert was in theatrical releases! Thanks! 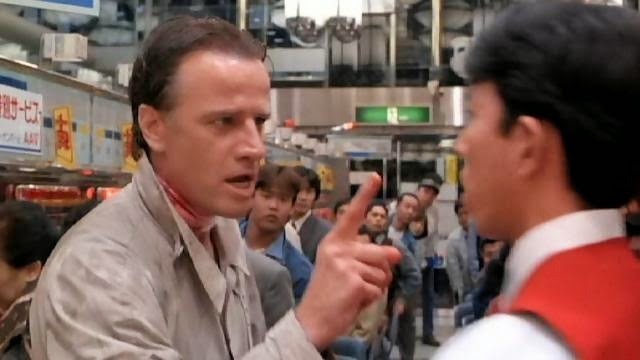 Good memory, you're right there's a big ninja fight on a train in the middle of the movie.